A tithe or collections box for your church can be an integral part of your church’s fundraising and having one custom made to match your new church pews can give the appropriate attention and importance to tithing and donations. Tithe boxes can also serve as a place for prayer requests for your congregation. If you have a need for a new tithe or collection box, we can help. Many churches are too large or don’t have time in their services to pass a collection plate. Other churches feel that people should not feel social pressure to tithe or be ashamed when they can’t. The reasoning behind a need for a collections box might be different from church to church but the requirements of a tithe box are all the same. The slot needs to be large enough to accept donations easily, it needs to be able to be secured, and the collections box must be large enough for the all congregation to make donations. Our collections and tithe boxes can be custom fitted to your needs easily and can be made to accommodate both churches and donations big and small. 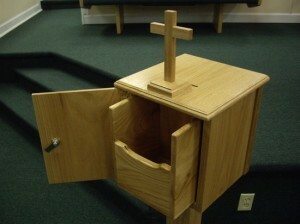 Our church collections boxes are made with a removable interior, shown here. This simple addition makes it easy to take donations out of the box and remove them to another area to be processed and counted. This can make collecting quicker. Instead of struggling with bundles of checks, cash, and coins, church staff can easily sort through it all without losing anything. The boxes also can be securely locked to prevent theft, which unfortunately does occur from time to time if collections are left unsecured. As well as being customizable in functionality, our tithe and collection boxes can be matched in style and color to your church and church pews. It’s a great idea to have one cohesive design in your church and by pairing the right collection box with your church’s architecture, design, and furniture, you can help highlight God’s message and continue your church’s missions. 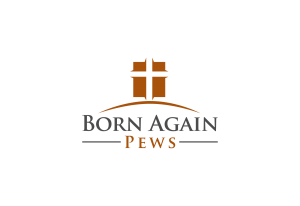 Collection boxes offer a convenient way for church members and visitors to make contributions in the Lord’s name.